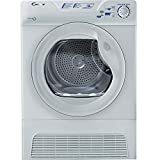 The Candy GCC581NB Sensor Condenser tumble dryer is the perfect family tumble dryer. With an 8kg capacity and featuring a highly efficient reverse action drum, this model offers the very best in performance! With an extra-large porthole it is easy to load and there is also a 40 minute rapid program which is ideal for jeans and towels. The filter care indicator also lets you know when to clean the fluff filter! The Glass door allows you easy visibility into your dry load.Featuring 4 levels of sensor dry technology, enables you to choose how dry you want your clothes from Iron Dry, Cupboard Dry, Extra Dry or even Bone Dry! Additional features include timer delay start, heat settings and a large door for easy opening.